An icon in the world of Texas smoked meat, Cooper’s Barbecue out in Mason is the mothership of all the Cooper’s that are now scattered around Texas. Consistency is the bane of all barbecue houses and Cooper’s suffers in this department. While the sausage is inevitably delicious, you’re rolling the dice when it comes to the other meats. 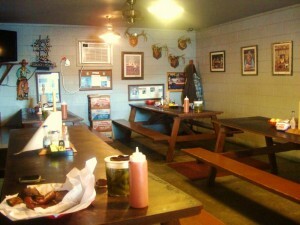 Since Mason is a solid two hour drive from Austin, I don’t make it out there too frequently but when I do I love to roll into Cooper’s for a plate of top flight sausage, a handful of saltine crackers and a leisurely hang in one of the coolest, old dining rooms of any meat house in the state. This entry was posted in Rural Texas, Texas Barbecue, Texas Barbecue Photos and tagged barbecue, BBQ, best barbecue, Brisket, central Texas hot guts, Pork Ribs, Restaurant, sausage. Bookmark the permalink.